In my on-going series of Turritella species, I did not include an Oligocene example. This is because during the Oligocene, the coast of California began to change its tectonic setting from a subduction-zone, where the ocean floor descended beneath California, to a collision with an ocean-floor spreading center. This collision began about 30 million years ago and initiated the development of the San Andreas Fault system. 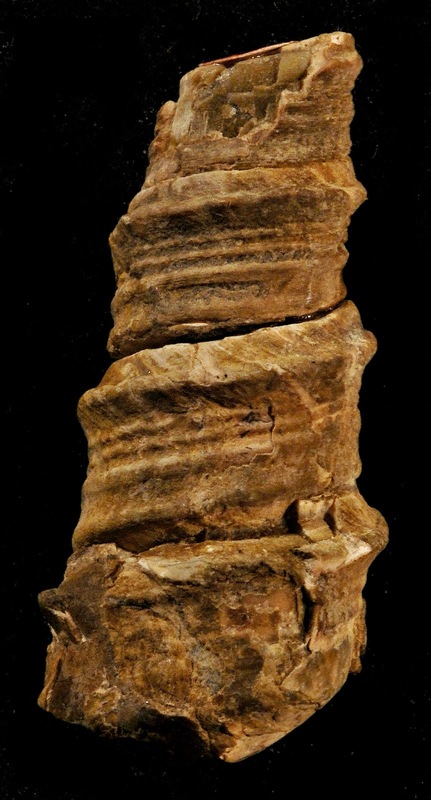 In response to the collision, nonmarine deposits were the norm during the Oligocene in southern California, and Turritella-bearing shallow-marine deposits became scarce until the Miocene. The following species lived during the early Miocene. 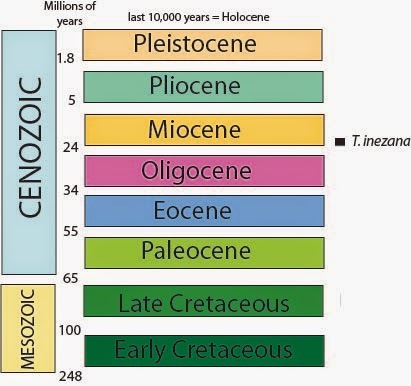 AGE RANGE: Cenozoic (early Miocene = about 22 million years ago). REMARKS: This species has a very prominent spiral rib, called a carina, on the posterior part of each whorl. The function of this carina is unknown, but it probably helped the snail stabilize its shell in silty deposits on the ocean floor.